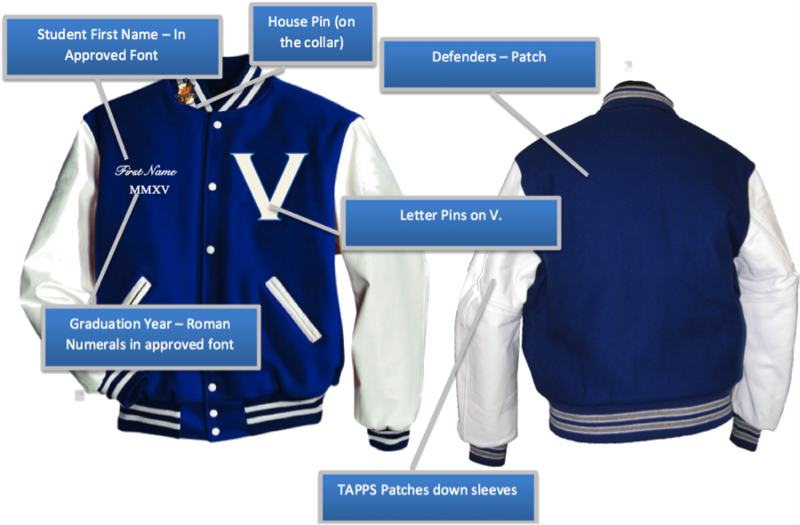 A student may not purchase or wear a Veritas Academy letterman’s jacket to any school function unless they have both earned the right to wear the jacket and adorned the jacket according to the policies detailed in this document. No items may be placed on the letterman’s jacket unless it is described in this document. Prior to discussion about specific letters and honors awarded and how these should be affixed to the jacket, we will turn our attention to the general aspects of the jacket itself. Letterman’s jackets should only be purchased from Centex Recognition and in the approved style. See the images below for where to position the various elements of the jacket (note: the images below are stock photos and not the actual colors, style, or stripe patterns of the Veritas jacket). A bar pin will be added each year for students who letter in multiple years. The image to the right shows a three-year letterman in soccer. If TAPPS recognizes an accomplishment, a student may place the official TAPPS patch to the sleeves. Students may only have one row of 5 patches on each sleeve (down the center seam). Once each sleeve is full, no more patches may be added to the jacket. (In other words, a student is limited to 10 patches total, so they should be selective about which patches to add). Qualifications for athletic letters - *Note: Coaches may petition the AD for recognition of a student who does not meet these standards but has made a significant impact upon the team. Cross-country, Golf, Swimming, Tennis, Track & Field – Represent Veritas at TAPPS regional or state meet. Wrestling – Be the number one wrestler for Veritas in any weight class at the TAPPS state competition. Team Managers – A student must manage three seasons. Qualifications for non-athletic letters - *Note: Sponsors may petition the SR Head for recognition of a student who does not meet these standards but has accomplished much. Earn a cumulative GPA, in a full load of coursework, for the year of 3.7 or higher. Finish in the top eight at the TAPPS state academic competition in an individual event. Theatre – Be selected for cast or crew for the TAPPS One Act Play competition. Visual Art – A student must have taken at least one trimester of art at Veritas that year and earn recognition by TAPPS at the state competition. Speech – A student must earn 75 points at NFL speech tournaments during that school year. Orchestra/Band/Drumline/Choir – A student must have participated in music at Veritas that year and earn recognition by TAPPS at the state competition. Dance – A student must have taken at least one trimester of dance at Veritas that year and earn recognition by TAPPS at the state competition. House crest – full color and 2x size of other pins.